We caught up with Tyler Thrasher for an insight into his particular art form. Tyler Thrasher is an artist whose parallel curiosities in art and chemistry have combined in a seemingly magical way. 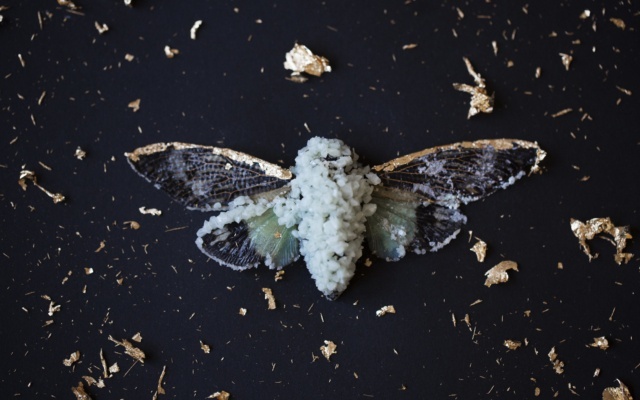 Using the bones and remains of animals that he finds while exploring caves and forests, Tyler creates crystalized carcasses that appear to be salvaged from an ancient and mystical realm. We caught up with Tyler for some insight into his work. Can you walk us through your journey to finding this unique method of art making you have developed? Since childhood I’ve always had a curious mindset and a knack for experimentation. My experience and journey with crystal synthesis has various roots, starting from my exploration into chemistry during my education. I spent a lot of time in advanced chemistry classes during high school, and during my college career I continued to explore my interest and curiosity when not focusing on my BFA. During college I also found myself outside more, observing and experiencing nature. I got into caving and spent hundreds of hours underground, exploring caves and cavern systems which lead me to an appreciation for mineralogy and crystalline structures. I spent enough time underground and exploring chemistry, that I eventually came upon the idea of synthesizing crystals and crystalline structures on to natural objects where they don’t belong. Where do you source your subjects from? I get my specimens from dozens of sources. A lot of my skulls I find while hiking. Friends and peers also give me the specimens they find while hiking or have collected them over the years. I get a lot of my insects from entomologists and insect enthusiasts who specialize in collecting and preserving dead specimens. I of course get some of my more unique and uncommon specimens from bones museums and shops, including my favorite shop in Kansas City, Oracle. Can you walk us through the process of creating one of your pieces? The process is more of a collaboration between me and molecular chemistry. My main contribution is finding the object, deciding on the molecule/compound I would like to use, picking a desired concentration and amount, and letting the principles of molecular chemistry and ionic bonds do their thing. I’ll prepare supersaturated solutions of the respective compounds and as the vat or container cools, the ions will reconnect and align according to their proper molecular geometry, which creates crystalline structures. There are a few challenges. For one, most compounds I use are toxic and fatal if a certain amount is ingested. The initial challenge was finding a suitable space to do this large scale and finding proper and ethical ways of disposing of the compounds that are toxic to the environment. The second challenge is fighting temperature and humidity, which can effect the batches to a certain degree. Some of the more fragile and smaller skulls can’t handle too many crystal baths either, or they’ll fall apart. Which has been your favorite piece? So far my favorite pieces are the ones that come out completely different than I calculated or expected. Either impurities in the container affected crystal growth and structure, or the growth rate landed itself to larger or more singular specimens. I have a case in my studio dedicated to the oddballs that I just couldn’t release to the public. Is there an overarching feeling or message you hope to communicate to your audience? Within the particular pieces, not so much. I think the most important things I’ve stressed to other creatives and individuals is that behind my work I pursue the vitality and importance of curiosity and experimentation. No idea floats through my head without at least seeing some effort towards manifesting it, and that’s something I had to train myself to do and my work to strive for. There’s usually an innate, childlike curiosity within humans and that can be put out for various reasons, whether that be through the lackluster education system or a lack of support from friends and family, but it’s important to wield that curiosity despite those factors and let it lead you through your work and craft. I have a list of creatives and individuals who inspire me daily, most of which are under my ‘follow’ list on Instagram. One of the most inspiring phenomena I can think of though is nature and its respective qualities. Whenever I’m feeling a slump in my work and flow I often find myself outside, hiking or looking for caves or any clues auto what I should do next, and it usually comes pretty quickly. I’ve actually nailed it down! Within any given outdoor experience I’ll find a vast amount of inspiration and direction within an hour and a half of being outside. It never fails! What has been the biggest lesson you have learned in your time as an artist? If you want to be mentally, spiritually and emotionally taken care of, sure! But “financially” isn’t a promise. I remind myself and others that if you need a part time job to keep making your work comfortably, that is actually the highest respect you could possibly pay your craft. It’s dangerous to look at your work and demand it goes out into the world and make you money. Follow Tyler on Instagram, or visit his website to see more of his work.